Most Climatica-compatible sensors follow the standard Instromet pattern of being individually mounted and cabled back to a main control box. All cabled sensors are supplied with 25m cable, which can usually be extended if required. Mounting details are included within each individual sensor description. The difference between Basic and Pro versions lies simply in the nature of the bearing used for the wind cups. The Basic version uses a sintered bronze bearing while the Pro version is has a ball bearing, which should give a lower start-up speed and better service life. The versions with integrated temperature sensor have this sensor mounted as part of the underside of the pole mounting bracket and are known as a ‘wind/temp’ sensor. The thinking is that this provides a cost-effective way of including the temperature sensor and by upgrading the anemometer cable from 4-core to 6-core also provides a means of simplifying the cable runs. However, while both pole and bracket provide a degree of shielding from direct sun, this will fall some way short of the protection afforded by a full radiation shield and temperature accuracy will inevitably suffer to a degree. For maximum temperature accuracy, a full shield is recommended. 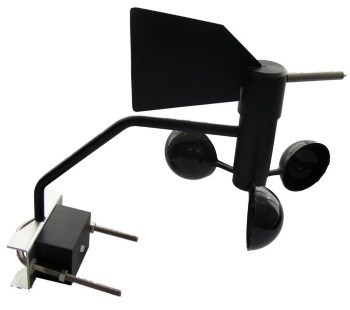 Both Atmos T models and Climatica stations are supplied as standard with the Basic wind/temp anemometer version. Please let us know if you might wish to upgrade to the Pro sensor version or revert to the wind-only versions (i.e. in favour of a separate temperature sensor – see below) and we will be able to make an appropriate adjustment to the pricing of the package. Mounted within a miniature radiation screen (i.e. a Stevenson screen) – see image right. This is obviously the preferred version for making accurate temperature measurements. 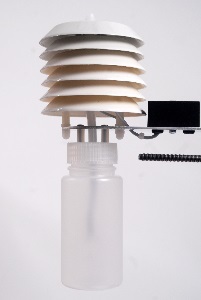 Climatica stations offer two distinct sensors for measuring humidity: Wet & Dry Bulb and Humitter. 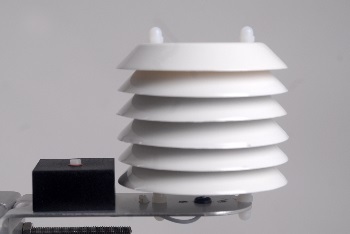 The Wet & Dry Bulb sensor (see image right) is obviously a direct electronic parallel of the traditional approach to humidity sensing. This sensor adds a second temperature sensor into the radiation shield as used for the temperature-only sensor pictured above. A wick surrounds this second sensor that dips down into a water reservoir below. Thus the second temperature sensor reads a true wet bulb temperature, which may appeal to some enthusiasts in its own right. The Climatica circuitry is able to compute a Relative Humidity reading from the combination of wet and dry bulb readings taken together. Software such as Cumulus running on a PC linked to a Climatica logger is also able to convert these Wet Bulb temperature readings to RH % and Dew Point readings. The water reservoir does need to be topped up occasionally, but it will typically last for several weeks. The second type of humidity sensor, the Humitter, is a specialist electronic capacitative type made by Vaisala. This is housed in a similar radiation shield to the Wet & Dry Bulb sensor, but obviously without the water reservoir. This sensor is connected to a special Humitter input on the Climatica stations and reads Humidity directly. The standard pressure sensor on both Atmos L and Climatica displays is a high-quality dial movement. Note that, as a purely mechanical component, this does not pass electronic pressure data back to the logger on Climatica models. Instead, there is a separate electronic sensor for barometric pressure that needs to be specified if pressure logging to a PC is required. This electronic sensor is mounted on a daughter circuit board, which fits within the main Climatica control box. 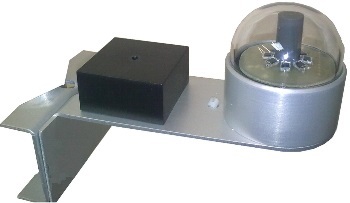 The IM rain gauge is an interesting sensor with a 3″ funnel diameter (~79mm) that uses an optical drop counter (as widely used in some scientific laboratory instrumentation) to deliver an impressive 0.01mm increment (0,01mm – that’s not a misprint!) and rainfall amount resolution. 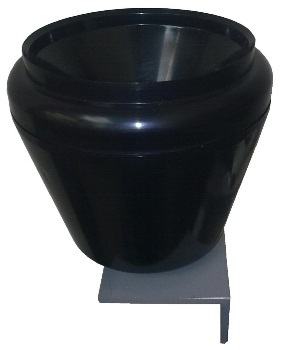 The rain gauge is of course a fully automatic, self-emptying unit that needs no maintenance other than very occasional cleaning of the funnel and cleaning/replacement of the built-in filter element. 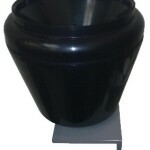 The gauge is supplied mounting on an angle bracket and suitable for attaching to the top of a wooden post. But a U-bolt conversion for attaching to a mast or pole is available at a small extra cost. The Climatica stations are perhaps unique amongst more affordable weather stations in having a sensor that can record hours of Bright Sunshine, based on sensing shadows cast by a central shadow pole on to a set of eight surrounding light sensors, and with the readings having a direct parallel to the traditional Campbell Stokes sunshine sensor. To be clear, this is not a global irradiance sensor, it measures sunshine hours in units of 0.01 hours daily (36 second increments). The main sensor element cables (25m supplied, extendable up to 100m) to a Sun Control circuit board which installs into the main Climatica control box. This circuit board then generates and accumulates the sunshine hours reading and passes this to the MWD display and (if fitted) the Climatica data logger. Using its U-bolt bracket and long cable, the Instromet sunshine hours sensor can be fixed to the very top of a mounting pole, where it will have the best chance of a fully uninterrupted view of the sky and thereby generate the most complete sunshine hours data. The Instromet sunshine hours sensor is an unusual, easily fitted and very effective additional sensor, which provides a fascinating reading, available to few other weather stations. This sun sensor is also available in a standalone version with its own electronic counter (that would need to be read once daily) and also, in another version, with its own separate data logger.